We don’t know if these are spooky or goofy but we smiled when we saw them, so they’re smiley. 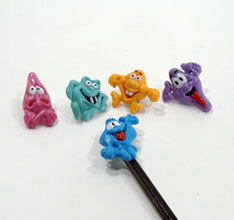 Assorted molded plastic faces and colors with a thick round clip to grip pencils or small barrel pens. Sold by the dozen. Bagged 1 dozen. $1.30 per dozen for 80 dozen or more. $1.15 per dozen for 160 dozen or more.